Having lost two of my trees to this voracious invader before we could take steps to save them and feeling that pain, I couldn’t understand why people weren’t responding to his offering. Then he showed me the card he was mailing. The card was a hot mess of everything that Ed, a certified arborist, could possibly provide – including lawn care! Everything was just about the same size. There were multiple promotions and discounts offered. Recipients were completely confused about what this company did, why they should call and how 4 Seasons could help. But the biggest barrier? Most people don’t know types of trees are planted on their lot! 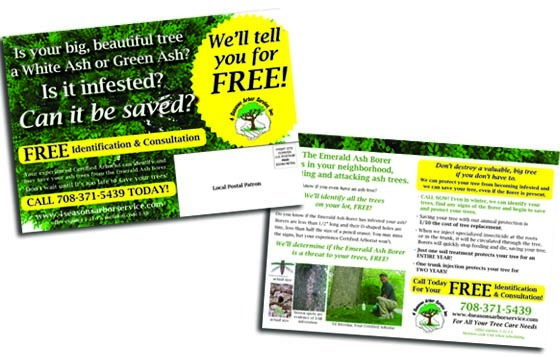 So we created a mailer that zeroed in with laser-focus on Ed’s biggest mission – saving those white and green ash trees. The call to action is simple – Ed will identify every tree in your yard for free, no strings attached. There is information about the Ash Borer’s size, hole shape and symptoms, but the overriding push is that you can’t save a tree if you don’t even know what it is. With Ed’s assistance with identifying about 10,000 homes in neighborhoods known to have EAB, we mailed even more cheaply than EveryDoorDirect by using postal route discounts. (Our mailing house ROCKS). Ed’s phone started ringing and he’s now meeting new customers and saving their trees! Even better? Even if responders don’t have an ash tree, Ed has personally introduced himself, he’s now their expert resource. That homeowner now has a trusted arborist, one they can turn to for pruning, for emergency services – even for lawn care. 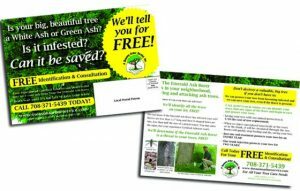 Interested in direct mail or other forms of response-driven advertising but oh so wary? Give us a call at 708-614-9766 or send us an email. We can help. I personally recommend Ed because he’s worked on my trees. I think of him as an Ent because he is indeed a Keeper of the Trees, deep in his heart. If you suspect you have the EAB, or just want to get to know your trees a little better, call Ed Ritzema at 708-371-5439 for a free tree identification!